These are exciting times at Student Energy. The past few months have been a whirlwind, as we came off of our time at COP21, into a series of events and opportunities. But, the most important and inspiring piece has actually been happening just under the surface – we have developed our theory of change. A theory of change is an organizational roadmap. It defines the end goal we are working towards and then utilizes backwards mapping to illustrate how an organization’s work creates the conditions for this goal to be possible. The big picture for Student Energy is we know the world needs change, the energy system must transition to a model that is sustainable and equitable for generations to come. To get there, we need change agents. Change agents are the people who will push, within every aspect of the energy system, to make our sustainable energy future a reality. University students are perfectly situated to become change agents. Students today are the leaders of 2050 who will see out our current climate and energy plans over the course of their careers. Hence, they have one of the largest stakes in our energy future. Student Energy's purpose is to provide the toolkit that will empower, teach skills, give knowledge, and instill values in students so they can become change agents. At the same time, the organization will work to make space in the energy system - with governments, industry, and civil society - so that these change agents have room to grow, learn, and act. This is the foundation of our theory of change, but it isn't something we pulled out of thin air. This has been in the works since 2009 when our movement began. Since the beginning, Student Energy has been an organic movement. It all began with one idea: students wanted their voices to be heard at an energy conference. To make this happen, they ran the first International Student Energy Summit. The event was a great success, empowering so many university students to become young energy leaders. Since the first Summit in 2009, Student Energy has been driven to inspire, educate, and unite youth around the world by facilitating programs that are designed for students by students. The model has had some incredible success, as we now reach 40,000 people in 120 countries. Enernerds have gone on to do amazing things: founding companies, working at the UN, joining the ranks of major energy organizations – if it has to do with energy, the enernerds are there! With all of this growth, success, and our executive director transition, we decided to take a look back at our results, and a look forward to envision where the movement can go next. Looking back, we wanted to define the “method to the magic.” What are the core traits at the heart of the enernerd movement? What is it that makes the enernerds unique, and able to push the envelope on energy? Looking forward, we want a big vision for where the movement can go next. 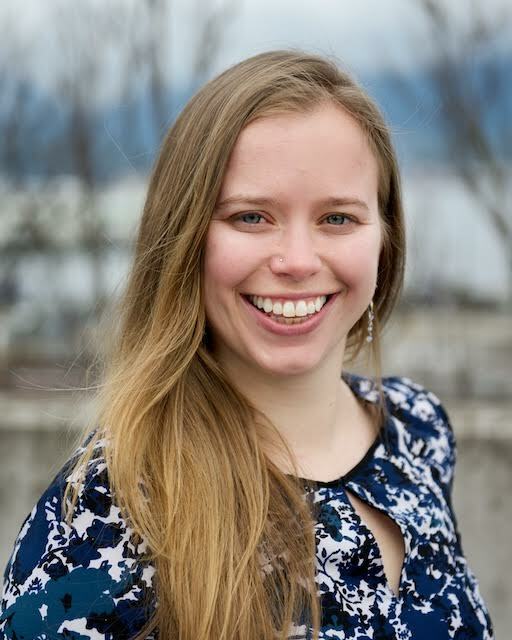 How do we use the core skills of the Student Energy community to create change agents who will accelerate the transition to our sustainable energy future? Ultimately, our goal is to provide the toolkits that will transform university students into change agents who will accelerate the world's transition to a sustainable energy future. 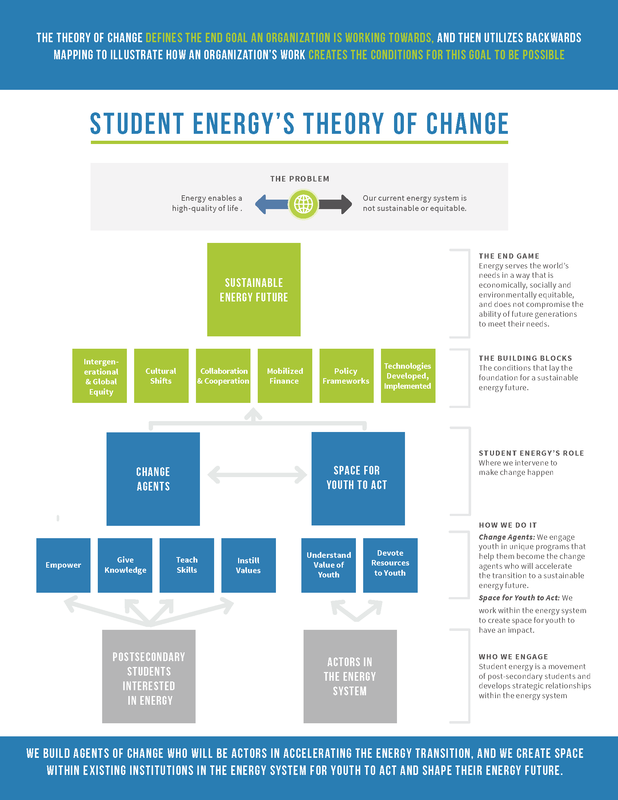 The diagram above outlines how we plan to make this happen, and I encourage you to download the full document, Student Energy's Theory of Change, to dive into details of how we define each piece. Our management team is very excited about this next phase for the organization. Keep your eyes on this blog, next month we'll be releasing our operational plan that outlines all the programs we're looking into in the next three years. Moving forward, our goal is for the movement to stay true to its roots of pushing for change with programing that's for students by students. There will be tons of opportunities for you to get involved along the way. If you have any feedback, or thoughts on our theory of change, I'd love to hear from you! Leave a comment or send me a note at meredith@studentenergy.org.